“Bajrang Bali ki Kasam,” the much-awaited Salman Khan Eid release, “Bajrangi Bhaijaan” is a far cry from the regular Salman Khan films. Though packed with a few self-glorification scenes and a far-fetched plot, this film, for a change, is sensible. It’s a light, emotionally-packed drama that touches your heart. 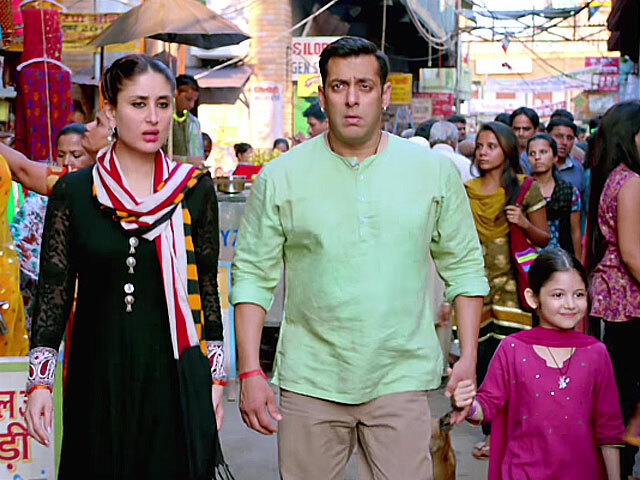 It is the story of Pavan Kumar Chaturvedi aka Bajrangi Bhaijaan, a sincere devotee of Lord Hanuman, who takes it upon himself to reunite a mute 6 year old Pakistani girl, Shahida, who he calls Munni, with her family across the border. What makes this film stand apart among Salman’s repertoire is that he plays the savior Bajrangi Bhaijaan with conviction of a simpleton and wins hearts instantly when he makes up his mind to do no wrong. So much so that when he is questioned, “tum bahadur ho ya bewakoof?” He has no answer. Salman Khan is his usual light-hearted self, doing what comes naturally to him. But, fortunately those scenes are so well-amalgamated into the screenplay that, even the frivolity displayed, seems like an extension of his character and gains credibility. His trials and tribulations are endearing and you are one with him in his mission. With not a single dialogue to mouth, little Harshaali as Shahida, floors you with her expressive eyes, especially her forlorn look. Your heart melts when she clings on to Salman and you chuckle when she is playfully naughty or yearns to eat non-veg. She shares a strong on-screen chemistry with Salman and probably that’s why the film is effective. Every other character in the film is well-etched. Nawazuddin Siddiqui as Chand Nawab a freelance small town broadcast journalist, who trails Bajrangi Bhaijaan while he is in Pakistan, performs competently. He adds a comic tinge to his character with ease, displaying his versatility as an actor. Kareena plays Salman’s love angle, Rasika. She has a miniscule role that does not go beyond the perfunctory glamour quotient. Sharat Saxena as Rasika’s father Dayanand and the actress who plays Shahida’s mother have their screen moments. The premise of director Kabir Khan’s film may sound like a simple road journey, but the tale unfurls with ample adventurous excitement laced with humour, melodrama and cinematic liberty which includes some tacky and stereotypical scenes. On the technical front, the film, with decent production values, has a realistic approach sans the glossiness of a block buster. Aseem Mishra’s cinematography captures the wide-scenic landscapes and the close up of the tear drop falling from Salman’s eye, effortlessly. The songs though well-meshed into the script don’t leave an impact on the narration. The first song with the lyrics, “Chal beta selfie le le re” which introduces Salman, is well choreographed. Whereas, the other song with the lyrics, “Bhook lagi bhook lagi, zoron ki bhook lagi (Chicken Song)a with some yodelling, has a racy tune of an oft-heard Konkani/ Marathi remix, but is chaotically choreographed. Both these songs cater strictly to front benchers. And the Sufi song “Bhar do jholi meri,” featuring Adnan Sami used in one of the episodic climax, is exhilarating, but lost in the mayhem of the sequence of events. Apart from Salman, watch Bajrangi Bhaijaan for its strong message of love and brotherhood bonding, which is so relevant today.